What are the most in demand marketing skills in 2016? Which marketing skills are most sought after by CMOs? What are employers looking for from digital marketers? If you supply digital marketing services, as a consultant, agency, vendor, or if you have created a useful service for marketers, then our Digital Marketing Marketplace is the perfect place to showcase your product or service and generate relevant leads. 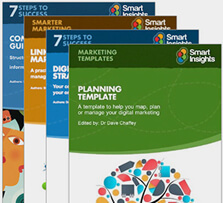 Smart Insights readers are hungry to learn about tools and services available to improve the effectiveness of their digital marketing. Learning how to improve their digital marketing is why they are on our site! Is your business making the right digital marketing investments? Integrated or ‘best-of-breed’ Marketing Tech – which is best? This new, independent research from the IAB and Winterberry Group reveals that Marketers are still divided over which technology will solve their key challenges - how to gather, merge and manipulate cross-channel data. 'Marketers are on a journey to unlock the power of their data by unifying it across desktop, mobile, CRM, email, point-of-sale and more. Their vision is to create a seamless experience for customers, but many brands are stuck in first gear because of the complex and difficult task of connecting massive amounts of fragmented data,' Mike Sands, CEO, Signal. In this report executive-level marketers and key experts mainly from North America, working in the advertising, marketing, media and technology industries gave their views and goals for cross-channel marketing, and how to extract the value of data along with the challenges of technology. Which systems do marketers prefer?